Netrix provides security vulnerability scans that expose your organization’s security risks and how to solve them. Get your free scan today. The economically-motivated criminals of today are highly aggressive and persistent, leveraging the same advanced attacks and tools as nation-states. Meanwhile, businesses are pressured to adapt and improve their security program with a lack of the necessary resources and expertise needed to protect against attacks. They are struggling to find ways to best protect their assets and data while maintaining productivity and meeting customer needs. Netrix offers cybersecurity vulnerability scanning and managed security services based on the Tenable Suite (Nessus, Cloud IO) of products, offered as a monthly subscription. SEIM is a one-stop solution that improves situational awareness to your systems and data, without compromising time and internal resources. Netrix works with McAfee to provide this solution as-a-Service with a monthly subscription and additional services. Netrix can assist in the design, implementation and ongoing management of perimeter security, filtering and endpoint protection solutions. Netrix provides preventative, detective, and corrective measures of control. 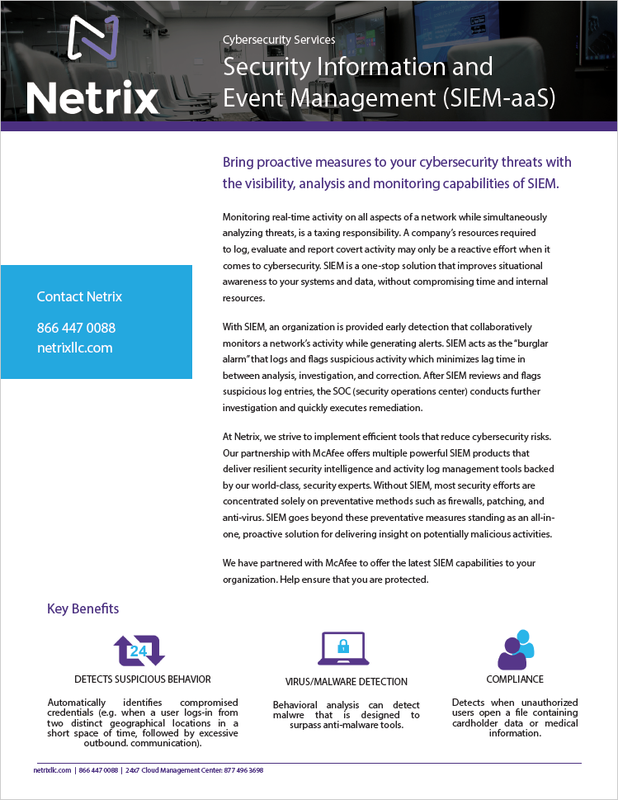 Netrix has the expertise to help assess an organization’s overall security posture and risk including governance, policies, and procedures. We also assess the implementation, maintenance, and monitoring of the services involved. Hackers start their attacks by running a vulnerability scan on a company’s systems, figuring out what is vulnerable, and then how to exploit it. Netrix can help you use these same tools, and then fix any vulnerabilities before hackers find them. The Netrix CMC Security Operations Center (SOC) services run 24x7x365, keeping an eye on critical data and technology assets, protecting customers from the latest threats and attacks. Ransomware is on the rise due to greed and financial motivation. Secure off-site backup copies / offline backups (this is critical, ransomware also attacks backups). SEIM provides an early detection that collaboratively monitors a network’s activity while generating alerts while acting like a “burglar alarm” that logs and flags suspicious activity which minimizes lag time in between analysis, investigation, and correction. After SEIM reviews and flags suspicious log entries, the SOC (security operations center) conducts further investigation and quickly executes remediation. Most organizations find that in addition to SEIM, they need a 24x7x365 Security Operations Center (SOC) to analyze, escalate, and respond to security events. Netrix offers SEIM-as-a-Service to deliver full and consumable support. Netrix understands the only way to reach the highest level in our customer’s security maturity level is to improve the three pillars: people, process, and technology. To do this, we provide a comprehensive assessment methodology to help businesses improve in all three of these areas. This is done by first working with the customer to understand their core business, how they operate, and what is critical. We then provide custom-tailored assessments and testing in security policies, procedures, controls, and architecture. Then we make recommendations to minimize risk to best protect your business. In addition, what sets Netrix apart from other security advisory firms is that our services don’t end with our recommendations. Instead, we continue to provide in remediation and ongoing support services. Netrix works with the best partners in the world to provide our clients with the most optimized solution for security protection.